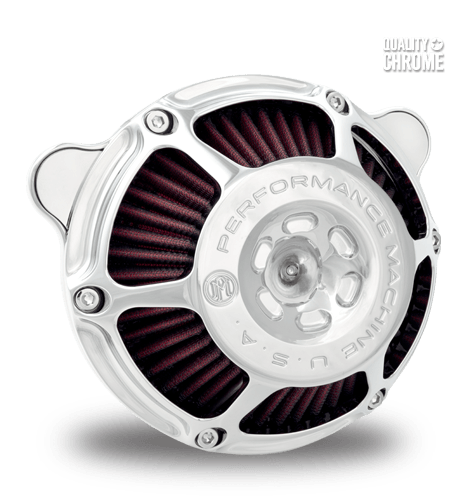 The MAX HP Air Cleaner isn't just another pretty bolt-on accessory that lacks substance. The newest addition to our air cleaner line-up features an innovative, conical shape for dramatically improved knee clearance, an internal power cone design for smooth, laminar air flow, plus a high flow reuseable air filter to give it life. Lightweight aluminum design, internal rubber breather tubes to eliminate oil leakage and easy installation all support the MAX HP's stunning good looks. And, it's made right here in the USA in Chrome, Contrast Cut, and Black Ops finishes with gaskets and hardware included.